Discussion in 'Sheltie Chat' started by GlennR, Mar 22, 2019.
force (someone) to walk forward by holding and pinning their arms from behind. 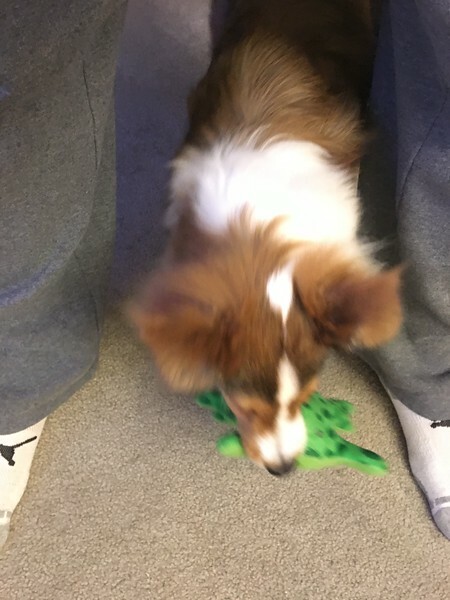 "the cop frogmarched him down the steep stairs"
Willow knows she isn't allowed to herd people by nipping at their pant leg or their slippers so she's taken to herding us along with the frog in her mouth while she walks between our legs to steer us around. Shelties are specialists in getting around the rules. KarenCurtis, Katie’s Mom, Sandy in CT and 3 others like this. Hilarious. I'm curious, since Willow is your first Sheltie, how she compares to your previous poodles, which are also smart dogs? Willow seems top of the chart smart. That's hard to answer. There's smart and then there's trainable and they aren't in perfect accord. The poodles seemed able to learn anything but didn't always love showing it. I taught them to retrieve and they would on command but they would stroll out, pick up the object and stroll back. Zero interest in it but they'd do it on command. It didn't really make you want to repeat it. LOL I suppose that was their aim. My older standard was definitely the smarter of the two. If the younger dog was on the couch with his head in my lap, the older guy would go get the younger's favorite toy and walk back and forth playing with it until the young guy couldn't stand it anymore and jumped off to get "his" toy. The older guy simply dropped it and hopped up to take his rightful place on the couch with dad with a big contented sigh. Both poodles mastered housebreaking very quickly, much quicker than Willow, but I think that's a size thing, they just had bigger bladders. Willow doesn't stroll for anything. She retrieves at top speed and loves it. That isn't smarter but it sure is easier to train when they are passionate about everything. If I had to choose I think, so far, Willow would fit between my two poodles and she's only a puppy. I'm keen to see what maturity will bring. She's a really smart cookie for sure. Over forty plus years with dogs I've been very lucky and Willow is simply lovely company. KarenCurtis, Katie’s Mom, Chris and 1 other person like this.